A small and welcoming amateur radio club based in Grays (Essex, England) close to the town centre. Primarily created for the local Ham community the Club is open anyone who has an interest in any aspect of Amateur Radio. Why not drop in to a meeting on the third Tuesday of the month for a chat, a cup of tea or coffee and a biscuit or two. 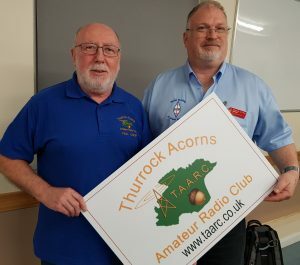 Thurrock Training Team is a small group of enthusiastic licensed hams on a mission to encourage more people into The Hobby especially younger people. You can ask for more information on any of the three licence levels or register interest by completing and submitting our on-line Training Enquiry form. 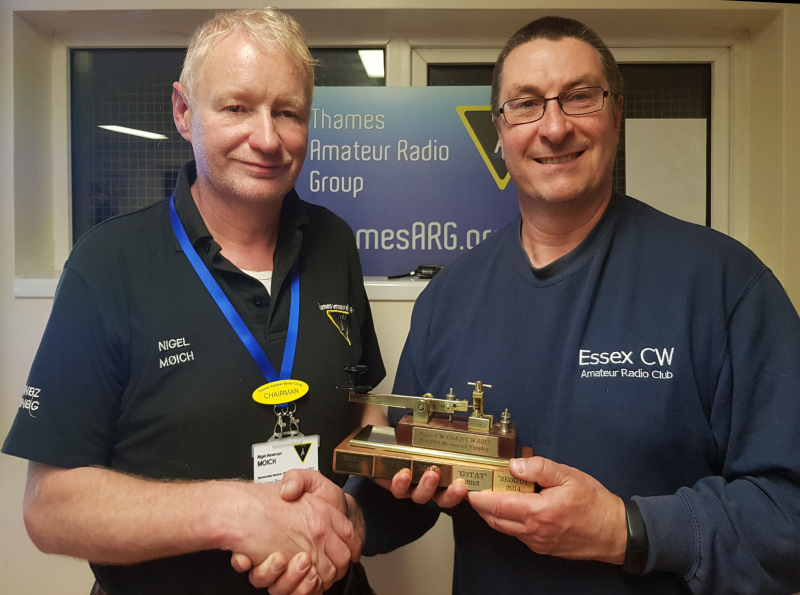 Acorns Member Nigel M0ICH (left) has been awarded the 2019 G4OAD Memorial Trophy for his contribution to Morse Code by the Chair of EssexCW, Dean G4WQI (Right). Nigel contributes to three CW nets including the Acorns CW net every Monday on 144.180MHz. He is also a volunteer CW operator at HMS Belfast (GB2RN) having visited the ship as part of a Acorns Club outing in 2017. There followed an honest debate on what has worked in the club over the past 12 months and what has not; this helped shape the agenda for the next 12 months. Broadly speaking the agenda is split into four themes: (1) Public Events with the aim of introducing new people to the hobby. (2) Field Events where the aim is to concentrate on operating radio at HF or VHF. (3) Club nights with a selection of speakers. (4) Surprise Bonus…. members-only visits, more information in the April Newsletter. At the club meeting on 19th February, Chair Paul G4MJM (left) was pleased to welcome David M0MBD (right) who has recently taken over as the RSGB representative for Acorns. David gave a brief overview of himself and his role within the RSGB. In particular he summarised the many developments taking place around the county and asked for feedback so that the views of members can be taking into account. He was able to help with some of the challenges in trying to engage with schools on the topic of amateur radio. The evening’s presentation was by another RSGB representative, Vic G6BHE, who relayed his adventures of “Not So Great Canal Journeys” which made an entertaining diversion from the usual radio topics. 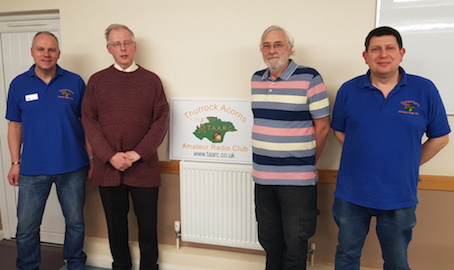 The new Acorns’ sign was shown to the group with the intention it be used at club events for publicity to help guide the public to our website. Statutory notice was given of the Annual General Meeting in March which should be a well attended event. It isn’t very often that our members get to meet a celebrity, but on 15th January Thurrock Acorns were pleased to welcome Gwyn Williams G4FKH who created the popular website www.predtest.uk and is an authority on HF propagation. 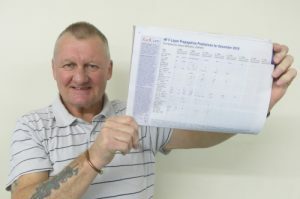 Gwyn is also the author the HF prediction chart that appears every month in RadCom (photo). Gwyn explained how the program worked in terms of the automatic updating of key information and gave an example of how to predict HF reception between two locations. The reason the prediction program is so popular is that it was written to avoid the need for technical input to be entered manually and the output is displayed in easy to understand visual graphs and maps. His easy going style made the presentation entertaining as well as educational. What Gwyn didn’t predict, being the first meeting of the new year, was to be invited to remain for a review of the many plans and opportunities that Thurrock Acorns has in store for 2019. This is going to be an exciting year and we got off to a great start. “Amateur radio is a popular technical hobby and volunteer public service that uses designated radio frequencies for non-commercial exchange of messages, wireless experimentation, self-training, and emergency communications. In reality it is much, much more. Have a look at these RSGB videos for a more interesting view of the possibilities Ham Radio presents.